Can I climb during the rainy months? Can I book a safari with TK? Can I climb during the rainy months of April, May or November? 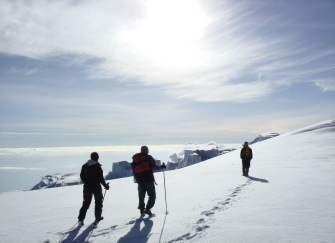 If there is heavy snow on the mountain it should be noted that reaching the summit can become more challenging than at other times of year, with your guide being required to cut and kick bucket steps for you. That said, there is no specialist equipment required and no reason why you should not climb during these months. Indeed there are peculiar advantages gained by doing so, notably that the summit is especially beautiful enveloped in white, and that the mountain is free from the crowding that is experienced during busy months. It may however be disappointing if some of the amazing views are absent because of rain en route to the high camp, so this should be borne carefully in mind before reaching a decision. We are thinking of booking a safari with TK. What do you need from me? Lake Eyasi. We have a rudimentary camp in a beautiful oasis nestled amongst the native hunter-gatherer Hadzabe bushmen tribe. This tribe still subsists by hunting and foraging. Time spent with these people is fascinating. Described variously by our guests as ‘like being inside a National Geographic film’ and ‘life-changing’, the insight gained into the simple, primitive and inspiring lives of the bushmen usually makes a lasting impression. Our safaris ensure that rather than merely observing the tribe, we interact closely with them while they teach us their skills. In the early morning we join the bushmen for a hunt, when en route or back at camp afterwards, there is an opportunity to learn how to make very effective primitive weapons from local plants; how to make poisons; how to make fire by rotating sticks; how to identify naturally occurring medicines; finding honey and water; and many other skills. Oldonyo Lengai. The sacred mountain of the famous Maasai tribe and an active effusive volcano. We do a night ascent, aiming to summit a little before sunrise while it is still dark so that we can see the luminous effusions spurting from the volcano. This is a very challenging undertaking on loose scree and sharp rocks and should not be underestimated. Lodges are not available off the beaten track, so unless opting for only a classic game viewing safari, you would need to be prepared to camp for at least a night, while other nights would be in lodges (availability permitting). Most of our safaris are arranged on a camping basis. 5 days would be the minimum for a safari that incorporates say, Lake Manyara, Ngorongoro, Serengeti and Lake Eyasi. As regards the cost of the safari, this would depend on your safari group size and whether you would be camping or would require lodges where available. If you were able to give an indication of these we would be delighted to propose some safari costs and itineraries. What is Team Kilimanjaro’s policy with regard to cancellations? 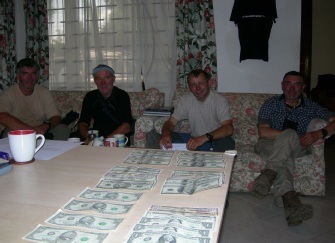 What costs are involved in climbing Kilimanjaro?